Yay! We are pretty much back up and running now that the computer has received a much-needed makeover! So I’m back to my regularly scheduled photo-editing, but I’m taking a quick 5-minute break to say hi – I hate to leave the blog so stagnant. And I also wanted to mention that I have quite a few 101 in 1001 updates, including this holiday related one: #76. Shop for Toys for Tots instead of donating money. Every year for the past four years, I’ve donated a little money to Toys for Tots, but I always see the piles of toys in the drop-off locations and think how much fun it must be to actually shop for specific toys and games instead of just making a donation. So this year Chris and I went to Target and picked out a few things, all of which ended up being my own favorite childhood board games. I went in armed with a budget (related to one of my other 101 in 1001 goals – sticking to a budget) and came away with three games for Toys for Tots, and…one game that I felt I personally needed to revisit from my childhood (intending to donate it to another charity after I was done): Perfection. Have you ever played it? I had it as a child, but I never actually played it by the rules. The thing scared me to death! Oh the pressure of putting those shaped pieces all in their appropriate slots in sixty seconds, else hear the wrath of the tray exploding the pieces everywhere. 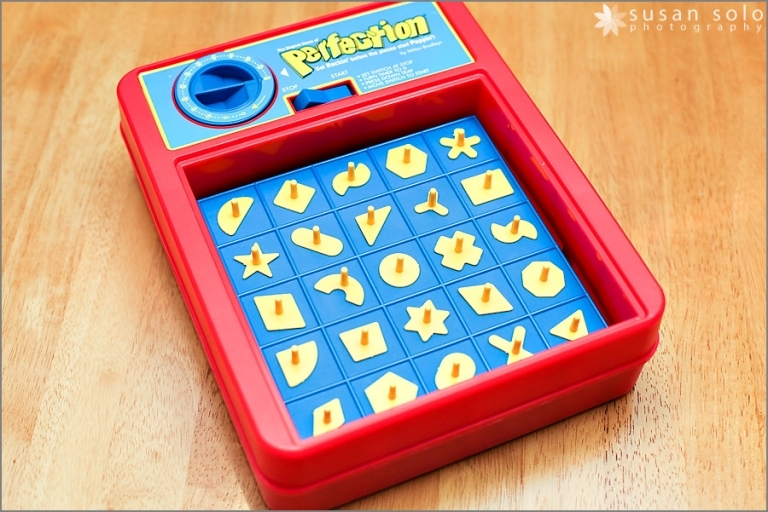 When I did play it, I would set the dial, switch it on and nervously place the pieces until the dial reached about T-minus ten seconds and then I’d shut it off. So I figured I should give it another try as a brave adult. Only I got completely side-tracked with trying to take a picture of the pieces popping out of the tray as a kind of fun photo challenge. The first few tries were blurry because of course I kept flinching at the sound of the tray popping, but I did get a few good ones. And for the record, Chris mastered the game at having all pieces placed in 55 seconds!